When did you get your start in photography and what drew you to fashion photography? My background is in fashion illustration, which I studied at the London College of Fashion for my degree. I fell into photography after needing to take my own reference shots for my illustrations. One of my best friends started a small photography business, and I used to help him edit photos, I ended up using his setup and fell in love with how the camera worked, what you can do during a shoot and after. My background in fashion gave me a deep appreciation for the high fashion aesthetic, and as social media grew, what was considered "fashion" became experimental. I think that's where I started to appreciate how certain brands explored themes visually, frequently through the medium of photography. Experimental. I don't believe I have a style, but I've been told my style of photography is quite recognizable which is cool. I try to blend a few creative elements whether it be artificial lighting, some digital manipulation and nailing the type of tone I want. What are some of the things you consider when taking an editorial? Styling is hugely important for editorials, as it pretty, defines the type of shoot I'm doing. I would say it's as important as how the editorial is shot. I also care a lot about the hair and makeup, but I'm blessed to have an incredibly talented makeup artist as a girlfriend, Rebecca Keates, so, like a good foundation, that side is pretty much covered. You can see how she rubs off on me. Like a bad foundation. I'll stop. 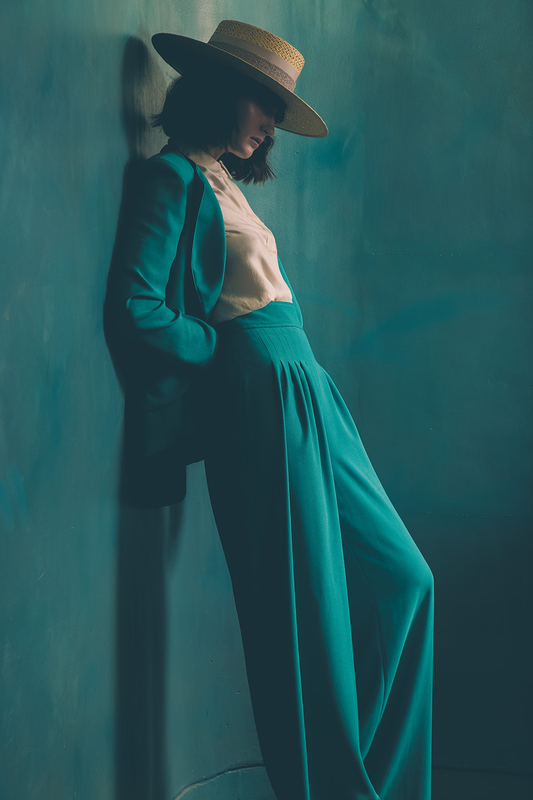 Probably the Lock Hatters' SS17 women's shoot, where I had an idea to shoot the model who was wearing a beautiful turquoise two piece suit (styled by The Style Siblings), to pose against a wall which had an almost identical color to the suit. Thinking it would clash, I was hesitant, but my colleagues encouraged me to try it. I took the first shot and almost collapsed from how powerful the shot looked; it was instantly my favorite shot I had ever taken. Speaking of collapsing, about 20 seconds after I took that shot, the model fell down the stairs and broke her ankle...What's creepy is the fact that her boyfriend, who is also a model, was also shooting that day, and had also broken his leg and was in another hospital in London at the same time. Bizarre. So yeah, that was pretty memorable! Which photographer influenced you and how did they influence, photo taking and career path? My absolute favorite at the moment is Kikixue; he has such impact with his photos in a 15th century Renaissance painting kind of way. I aspire to have that kind of impact with my visuals in the future. I think in general, it's image makers on the web that inspire and influence me. I get hit deep in the heart when I see compelling visuals, and I often have a running dialogue in my head asking, "Why did they do that? What made them decide to add that or shoot it like that?" Those are the questions I want people to ask themselves when they see my work too. Style is a reflection of you; it's what you consciously or subconsciously decide to portray and that comes from experimenting, pushing yourself, overcoming fears, learning, etc. I have been tripped up in many areas in the past trying to decide "what is my style" when it pertains to fashion, art, photography. I keep coming back to the fact that my style is an amalgamation of my influences, of the things that I like, which is vast and therefore not easily defined. Editorials are a collaborative process. What is it like to always work with new stylists, models, & designers? It's great. I like working with new creatives, but I'm also a fan of keeping a smaller core team of people I get along with really well. I love it when people own their areas of expertise and push their creativity to the maximum, it allows me to match their effort and come out with something powerful. I've got myself a little art/ photography studio. I will be working on a LOT of fine art/ photography blends very soon. Also exploring an interesting topic of "synaesthesia," which I strongly encourage everyone to Google. I'm very excited for it!